Most well-known for his 'History of the English Church and People', the Venerable Bede wrote other best-sellers, many of them commentaries on the books of the Bible. His books were studied by theologians throughout the middle ages. Bede lived from boyhood until his death at the monastery of Jarrow, but his tomb is in Durham Cathedral. This manuscript of his commentary on the Book of Proverbs (of Solomon) belonged to the library there. 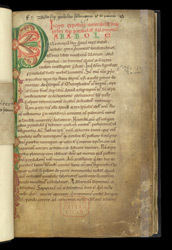 The first page begins the book with its first letter enlarged nearly to the size of the page and decorated with early 12th-century style ornament, using limited colours. A large decorated letter usually marked the beginning of a book or sections within it, although the degree and style of ornament could vary as suited the nature of the book and the wealth of the person or community having it made. Books for study, like this one, often have simple decoration. At the top, a librarian has inscribed the title of the book.